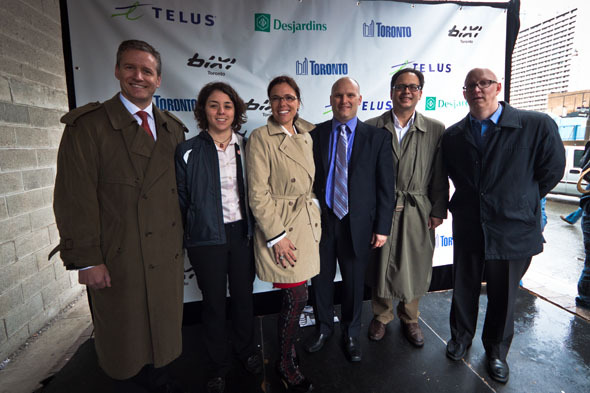 Toronto's BIXI bike share program kicked off today at Yonge and Gould with a group of prominent members of the cycling community, city councillors, and sponsors TELUS and Desjardins rolling into the launch on their shiny new steeds. The program will provide Torontonians with year-round access to 1,000 bikes located at 80 stations in the downtown core. The Public Bike System Company (PBSC) is the organization behind BIXI, the first large-scale bike sharing system in North America. 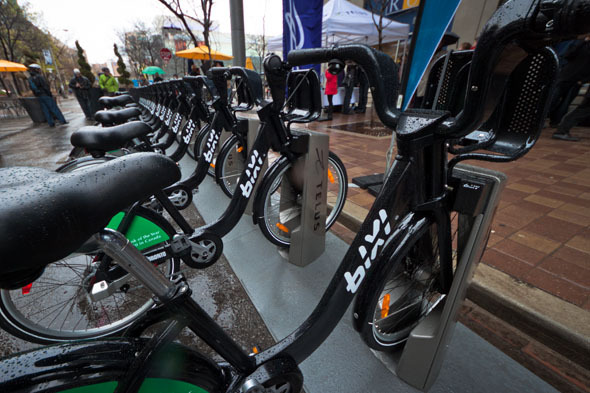 Users borrow a bike from a BIXI station and return the bike to any station in the network. 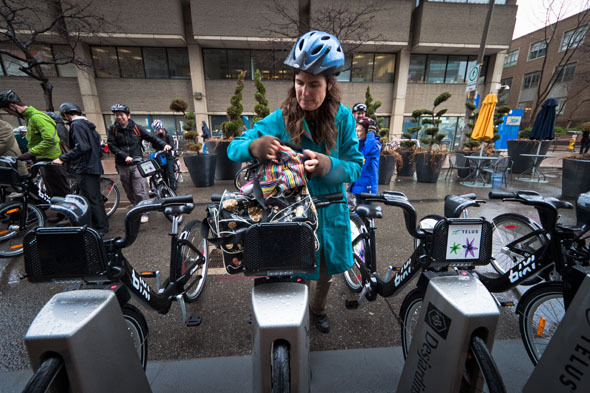 PBSC's bike sharing system has already been implemented in various cities, including Montreal, Washington, and London. Memberships cost $40 for one month and $95 for a year, enabling users to loan any bike in the network using a BIXI-key. Otherwise, non-members can purchase a 24-hour pass for $5 and a 72-hour pass for $12. A 30-minute trip is allotted per rental, with additional fees incurred past that time. More information can be found on the BIXI Toronto website. Two smartphone apps, Spotcycle and Bixou, are also available for keeping track of station locations. 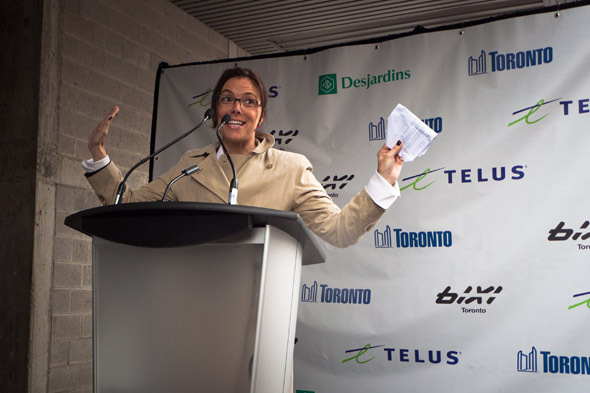 "BIXI is an important part of the city's efforts to encourage cycling," said Councillor Denzil Minnan-Wong (Ward 34 Don Valley East). "We are confident that this public-private partnership will dramatically increase bicycle trips in the downtown core." "Support for healthier cities is part of our DNA at TELUS," said Anne-Marie LaBerge (pictured), vice-president of consumer marketing communications at TELUS. "Initiatives like BIXI allow all of us to help safeguard the environment while staying active in our day to day lives--and beating the traffic!" According to LaBerge, TELUS will also be donating $1 for every year membership purchased to the Heart and Stroke Foundation. "For Desjardins, this is more than a mere sponsorship opportunity," said Tom Little, managing director of investment banking with Desjardins Securities. "We strongly believe in sustainable development and contributing to the wellbeing of our neighbours and communities." The City of Toronto guaranteed $4.8 million for the project's startup capital, according to Gian-Carlo Crivello, director of business development for the PBSC. Currently, the program has 1,000 registered members, but reaching 7,000 to 8,000 users this year is the goal. For more photos of the BIXI Toronto fleet, check out this slideshow.